The Hawaii Superferry Alakai sits at Pier 19. The company announced yesterday it will place its 349-foot vessel into dry dock for nearly three weeks for maintenance and recertification by the U.S. Coast Guard. Hawaii Superferry will suspend service from Wednesday through March 2 so it can undergo maintenance and mandatory recertification by the U.S. Coast Guard. The Alakai, plagued by high seas and equipment problems since its mid-December restart of service, originally had been scheduled to go into dry dock in May. The company said it is doing so now to take advantage of the off-peak travel season and to make permanent repairs related to the ship's auxiliary rudders, as well as to obtain the recertification. Passenger levels have so far been far below its break-even average of 400. 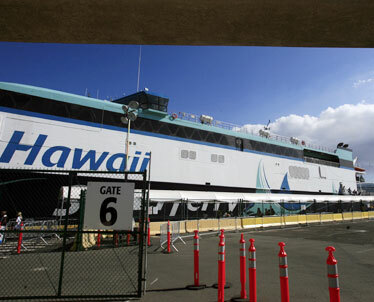 Hawaii Superferry, plagued by weather- and equipment-related shutdowns and low ridership levels, said yesterday it will place its 349-foot vessel into dry dock for nearly three weeks for maintenance and recertification by the U.S. Coast Guard. The company said the mandatory annual dry dock, originally scheduled for May, was moved up to Wednesday through March 2 to take advantage of the off-peak travel season and to make permanent repairs related to the ship's auxiliary rudders. Passengers holding reservations are being notified and will be reaccommodated on a future voyage or refunded. Hawaii Superferry, which restarted service Dec. 13 after a court-ordered shutdown in August over environmental concerns, had based its break-even business model on carrying an average of 400 passengers and 110 vehicles per trip. But the numbers to date have been far below those levels, in part because the restart of service was hampered by heavy winter seas. An exhibit filed by state Deputy Attorney General William Wynhoff with Maui Circuit Court on Jan. 31 showed that the number of passengers booked during January between Honolulu and Maui ranged from 83 to 349 on days that the Superferry actually operated. The number of vehicles for those days ranged from 19 on the 6:30 a.m. New Year's Day voyage to as many as 94 vehicles. The Superferry did not operate for seven days in January -- Jan. 16-17 and Jan. 27-31 -- due to weather conditions and rudder-related repairs, but bookings were nevertheless still shown for those days in the court filing -- with one day showing as few as seven passengers and four other days with 20 or fewer passengers. Terry O'Halloran, director of business development for the Superferry, said that the Superferry has not carried "anything close to those low numbers." The numbers filed with the court were bookings and "not actual numbers," he said. "They're a snapshot of our booking report," O'Halloran said. "They're not accurate numbers. Passengers are booking relatively close to the time of travel, so at no time did we book anywhere close to the low numbers shown on there. Those (low) numbers say to me they were taken several days before those dates because those numbers reflect early bookings." O'Halloran said that he did not have exact daily counts available, but that the 83-to-349 range produced in the exhibit on the days of operation sounded "about right." "With any startup, you have a ramp-up period before you get to the number that you're anticipating, and we definitely want to see higher numbers," he said. "But we're not disappointed with the numbers we're currently having, especially in consideration of starting up in the winter season. We're looking forward to having the boat come out of dry dock in great shape and getting back into service and providing the service that we intended for the people of Hawaii." O'Halloran said the Superferry had planned on being idled for 2 to 3 percent of the time during the winter season due to inclement weather but that the downtime for the rudder repairs was unexpected. He said the rudders, which are used to improve passenger comfort and fuel efficiency, were removed for an interim repair but that the Superferry found that without them the ride suffered. "So we thought we'd just move up the timetable and do permanent repairs on the rudders and maximize our passenger comfort and take care of our annual dry-dock requirement at the same time," O'Halloran said. O'Halloran said construction "is a little bit ahead of schedule" in Mobile, Ala., on the Superferry's second vessel, which is scheduled to go into service in early 2009. "We're committed to Hawaii and to the long term for providing this alternative form of interisland travel," he said. "The second vessel will allow us to connect all of the islands and provide a level of service greater than we can provide with one vessel." O'Halloran said the Superferry is still looking at beginning a second daily voyage to Maui beginning this spring. It has yet to set a date when service will resume to Kauai.